Landing at Waimea, the Hawaiians thought they were being visited by gods. One can only imagine their curiosity at the British visitors who wore tri-cornered hats, smoked pipes and packed major heat had guns. Hawaiians were familiar with iron but only from nails in driftwood that washed ashore but Cook’s ship contained a remarkable supply of iron of all kinds to the locals. Cook was, by most accounts, a decent fellow, but sailors being sailors…their arrival coinciding with a time of great upheaval and ultimately ended up causing significant problems. Although Cook was initially welcomed, he met with a rather unpleasant death in 1779, being beaten and stabbed in a squabble over a stolen rowboat. Ultimately his remains were returned to the British and Cook was buried at sea in Kealakekua Bay. Taking a short side trip to the ‘downtown’ section of Kona on Alili Drive to check out the usual tourist traps shops we passed by the old church across the street from the Hulihe’e Palace. Tropical 19th century architecture is quite fascinating as are the plethora of coffee shops at every nook, cranny and turn. Hard to believe there is so much emphasis on the coffee since Hawaii is rather low on the totem pole of coffee producers in the world, not even in the top ten. But most people know that Kona coffee is quite tasty and I for one especially enjoy Kona’s liquid nirvana. 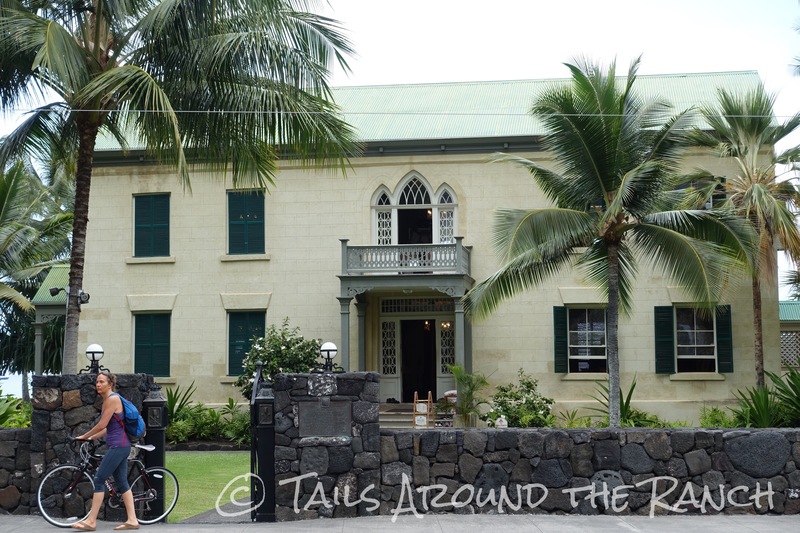 The palace built in 1838 by then Governor Kuakini quickly became the vacation spot for Hawaiian royalty until 1914. Currently it is a museum that houses an impressive collection of Koa furniture. The church was the first Christian church built on the islands. Built of lava rock and crushed coral with Koa hardwood gracing the tall interior. Joints inside were attached with pins made from gnarly ‘ohi’a trees. As for Sam, seems like he’s still a bit lost trying to figure out why the days are so long without his uprights in the midst of hectic hounds. Have a terrific Friday; I’ll leave you with one last photo-op from the beach that didn’t get watermarked because I was too lazy tired to go back and hassle with the app (cue gnashing of teeth). On my bucket list to visit there. Thanks for sharing. I especially love that the church was built out of lava rock and crushed coral and that the joints inside were attached with pins made from gnarly ‘ohi’a trees. You have to use the materials at hand, I guess. Are any other structures there made from the same materials? My son seems to think there’s another church (Living Stone) further down the coast that is and probably a few other structures as well. Guessing the original islanders used all available resources. Cook did ask for directions but couldn’t understand the answer in Hawai’ian. How interesting. When our pawrents went there to visit (another island) they learned all kinds of things too. Mom says the trouble is remembering! I loved your photographs, particularly the ones of the Congregational Church. In 1836 South Australia was just established. Sam looks a bit lost and out of things sitting there on his own. At least I think that’s Sam occupying the centre area of the photograph. He will be so glad to have you back again. I’m sure he will…after sufficient pouting and paybacks. BOL! Thanks for happy memories of some wonderful trips. As for having that video cam to check in on…. that would be dangerous for us! I fear we’d be watching it constantly! Bet you are looking forward to reuniting with your boy! Have a great trip! Kileua has been very active for the past couple years-Mauna Kea is dormant. Night views at the caldera are beyond amazing. Small world, isn’t it? Glad my son lives here so I can come for visits. The early history of Hawaii sounds fascinating, thanks for sharing!